At the start of this month, Superman turned 80 years old. The iconic Action Comics #1 was released at the end of March 1938, and this month marks the release of Action Comics #1000. Clark Kent and his alter-ego Superman – or Superman and his alter-ego Clark Kent, depending on how you look at it – have permeated our culture. Here are just a few of the stories for those unfamiliar with Superman that you might not have heard. Remember when the President of the United States of America wasn’t a cartoon villain? Worse than a cartoon villain — at least when Lex Luthor ran for president, he actually put his companies into a blind trust (that’s a genuine Superman comic, look it up). Stretch your mind back to what seems like aeons past and you might remember Barack Obama. Well, it turns out Obama was quite the fan of Supes. Not only is there the adorable footage of Obama posing with a Lil’ Superman on Halloween, Obama has joked about actually being The Man of Tomorrow. “Contrary to the rumours you have heard, I was not born in a manger. The former president is clearly a fan of the last son of Krypton. And though it’s a standard line for politicians to pretend they don’t think they’re divine and deny being Jesus, only Obama has upped that gag, by claiming to be someone better than Jesus. Don’t get me wrong, Jesus is great but he’s never had to fight an 80-foot mechanical gorilla. Game, set and match. It’s easy and lazy to draw similarities between Superman and Jesus. He’s actually much more likely to be inspired by Moses, and a slew of academics and authors have written papers and books on Superman’s heritage. Both Joe Shuster and Jerry Siegel, Superman’s creators, were Jewish and a parallel can be drawn between Moses being sent up the Nile to live with Pharaoh and avoid his death until the time that he could lead the Jews out of Egypt and baby Kal-El being sent to live amongst the humans, avoiding the destruction of Krypton and eventually leading humanity — and what remains of Krypton in little glass jars — into the future. Even the “El” in House of El, is Hebrew for God, with Kal-El not being entirely dissimilar to the Hebrew for Voice of God, aka Moses’ job. One set of people who certainly thought that Superman was Jewish were history’s biggest dickheads, the Nazis. Both Hitler and Mussolini denounced Superman as Jewish — a quality that, it goes without saying, they were not fans of — and tried to ban Superman in Europe. Of course, Superman and his Timely Comics counterpart Captain America joined the war effort long before the America government and eventually, America GIs brought comics with them to Europe, comics depicting the world’s worst Charlie Chaplin impersonator getting repeatedly clobbered. Whether he’s more like Jesus or Moses, there is no denying his godly quality. But it’s not often that the form of God takes the shape of a Canadian. Or at least a half-Canadian. Joe Shuster was born and raised in Toronto until he was 10 years old, making Kal-el Canadian. That’s probably where he gets his good manners. So that’s another person you can add to your “oh they’re Canadian” list. In 2011, to celebrate his Canuck heritage, the Royal Canadian Mint released a limited $20 silver coin featuring Superman on one side, and the regular, old boring Queen on the other. She can’t even bend steel with her bare hands. What’s the point? The super coin backfired, however. The $20 coin was sold at a tax-free face value of $20 dollars. But after the price of silver dropped and thousands of coins featuring Superman and other pop culture icons were returned for a full $20 refund on a piece of metal no longer worth that amount. The company that produced them, Face Value, lost somewhere around $17m. Maybe Superman is better off in America after all. Though unsurprisingly, like a lot of immigrants to America, the FBI probably has a file on him. In 1945, two FBI agents entered DC headquarters and interviewed Jerry Siegel about a Superman story featuring a cyclotron, an important piece of equipment used in the development of atomic weapons. They had read about the upcoming story in The New York Post and were a little confused as to why Superman was revealing details about America’s War efforts. Siegel had passed writing duties onto Alvin Schwartz, who had read all about America’s War efforts way back in 1936 in an issue of Popular Mechanics. Alvin Schwartz believed that Superman actually exists, in real life. Schwartz had written for Superman for a number of years and eventually became a novelist. As he became more and more interested in the process of creation he claims to have met a monk named Thongen. Thongen revealed that he was a tulpa, a Tibetan Buddhist concept of a thought that has taken form, and he introduced Schwartz to a whole world of esoteric. One day while taking a cab, Schwartz looked over to his side to see Superman sat there, in his cape, his underpants on the outside; the full works. Superman wouldn’t talk to Schwartz and instead flew out of the cab to stop a nearby bridge from collapsing with his heat vision. Or so Schwartz claims. It may have just been a particularly rude and dedicated cosplayer who flew across a river to save a collapsing bridge with his heat vision. You would be surprised at the lengths people would go to emulate the Metropolis Marvel, as he’s often called. Herbert Chavez of the Philippines is a Superman super-fan and has become famous for undergoing 27 separate plastic surgeries to look like the man of steel. These surgeries have ranged from chin and nose reconstruction to skin whitening and eye implants. At one point, Chavez had the world’s largest collection of Superman memorabilia, a feat which got him into the Guinness Book of Records and likely made him the envy of fans worldwide, including Christopher Dennis, The Superman of Hollywood Boulevard. Dennis is known have a fair resemblance to Christopher Reeve – without having surgery – and for dressing as Superman outside Mann’s Chinese Theatre and posing for pictures with tourists. It wasn’t a salaried job and Dennis worked for tips. Over time, he became homeless, placing his Superman collection in storage. Sadly, after several assaults and thefts, Dennis was left without his collection, without his cape and in need of medical attention. Luckily, the story managed to reach the ears of fans around the world who through Kickstarter, sent him enough money to buy a new costume and to create a documentary series based on his life. There is a long list of people who have been affected by the so-called curse of Superman, a hex that dooms those involved in movie adaptations of the Big Blue Cheese’s adventures, but the main two are the actors George Reeves and Christopher Reeve. George Reeves played Superman way back in the ’50s. Because everything was still black and white back then, Reeves costume was several shades of brown, because apparently red and blue just didn’t look like people imagined red and blue would look like on black and white celluloid. At a live performance –in red and blue- a young boy pointed his father’s gun at Reeves, knowing full well that a bullet couldn’t hurt Superman. Without breaking character but probably turning his costume several shades of brown, Reeves was able to convince the boy that whilst he would be fine, the bullet may ricochet into the audience and hurt a bystander. This allowed Reeves to take the gun. Reeves was never able to be taken seriously as an actor and couldn’t escape the shadow that the cape with the golden S cast over him. He met a tragic end at the end of a pistol, though the circumstances are suspicious and the official ruling of suicide has been contested. The story of Christopher Reeve (without as S) is well known. He is perhaps the most iconic Superman and the first actor to make Clark Kent and Superman physically different, making Kent a bumbling farm boy in a poorly fitting suit and Superman an imposing yet cheeky figure. Incidentally, he was trained for the role by British strongman David Prowse, the bloke who played Darth Vader. After being thrown from a horse, Reeve became quadriplegic and fell into a deep depression. This black cloud that could only be lifted by his former Juilliard room-mate and the man who provided him with comics as reference material for his role. The cocaine-fuelled comedy troll, the late, the great Robin Williams. 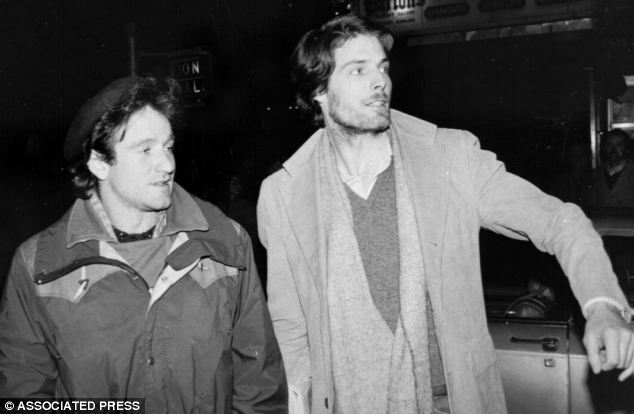 Hollywood’s seemingly unlikely and unmentioned best friends, Williams managed to cheers Reeve up by pretending to be a doctor come to give Reeve a rectal exam, causing Reeve to laugh for the first time since the accident. The bitter tragedy of these Supermen is only barely softened by the kindness of those who came to save them. More bitter still, is the sad fact that even the creators of Superman needed saving. Humble beginnings and happy endings? Siegel and Shuster had been working on Superman since their teens and were just 24 when they manage to sell Superman. They received only $130 between them for their story and the rights to the character that would spark a multi-billion dollar industry. The actual cheque they received, on which their names were spelt wrong, sold at auction for $160,000, meaning it had over a thousand times more value to a collector than it actually had to the creators. Though they would receive small handouts over the years to stop them asking for more money as Superman began to dominate pop culture, the two were eventually ignored and cast out of the industry. They were poorly paid off by DC and their names were removed from the Superman Family of comics byline. Shuster, who slowly began to go blind, had to give up art and worked as a delivery man, and suffered the indignation of being thrown out of DC offices after delivering a package. Siegel tried to take on DC legally, at a massive financial cost. He struggled on, writing for lesser-known titles and Stan Lee even gave him a few jobs after seeing how much tough a time he was going through. They were all but forgotten about when Jerry Robinson, a creator who invented the Joker spotted an article about Shuster living in an assisted care home in his newspaper. With the help of Neil Adams, Robinson managed to rally the elderly Siegel and Shuster to take on DC and its parent company Times Warner. Superman: The Movie was about to be released and sensing that treating the decrepit and elderly creators so cruelly over the years might look bad to people who love truth, justice and the American way, Times Warner bargained. Their byline was restored and has since remained while the pair were given $20,000 a year for the rest of the lives as well as health care. It’s not much given the disrespect DC treated the boy creators with, the billions of dollars that Superman has generated over the years and the legal battles that have continued for the pair’s remaining family but seeing their names next to Superman’s again made them happy. And there you have it. Here’s to 80 more years of the Man of Steel and the countless tragic, ironic, silly, unbelievable and astonishing stories he’ll continue to inspire.